API Gateway can store generated authorization codes and access tokens in its caches, in an Apache Cassandra database, or in a relational database. The authorization server issues tokens to clients on behalf of a resource owner. These tokens are used when authenticating subsequent API calls to the resource server. These issued tokens must be persisted so that subsequent client requests to the authorization server can be validated. You can configure authorization code and access token stores under the Environment Configuration > Libraries > OAuth2 Stores node in the Policy Studio tree. The authorization server can cache authorization codes and access tokens depending on the OAuth flow. The steps for adding an authorization code cache are similar to adding an access token cache. The Purge expired tokens every setting enables you to configure a time interval in seconds after which a background process polls the database looking for expired access or refresh tokens or authorization codes and purges them. Right-click Access Token Stores in the Policy Studio tree, and select Add Access Token Store. In the dialog, select Store in a cache, and select the browse button to display the cache configuration dialog. Add a new cache (for example, OAuth Access Token Cache). For more details on API Gateway caches, see the API Gateway Policy Developer Guide. Create the supporting schema required for the storage of access tokens, refresh tokens, and authorization codes using the SQL commands in INSTALL_DIR\apigateway\system\conf\sql\DBMS_TYPE\oauth-server.sql where DBMS_TYPE is the database management system being used. Schema are provided for Microsoft SQL Server, MySQL, Oracle, and IBM DB2. In the dialog, select Store in a database, and select the browse button to display a database configuration dialog. Complete the database configuration details. 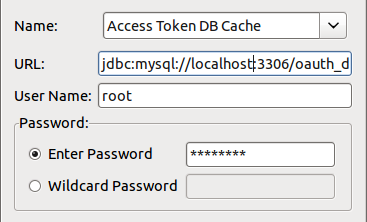 The following example uses a MySQL instance named oauth_db. For more details, see the API Gateway Policy Developer Guide. 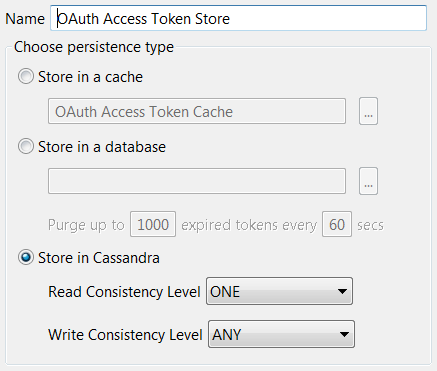 You can configure Read and Write consistency levels for the Cassandra database. These control how up-to-date and synchronized a row of data is on all of its replicas. The default Read setting of ONE means that the database returns a response from the closest replica. The default Write setting of ANY means that a write must be written to at least one replica node. For more details on Apache Cassandra, see Install an Apache Cassandra database in the API Gateway Installation Guide.